The hat that made us famous. This suede hat has a medium/wide curved brim that really looks great on your head. 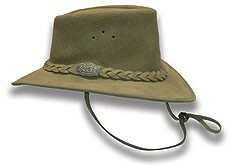 The brim is reinforced with nylon to retain the shape and the plaited hatband finishes it off. A “must have” if you are new to the range.